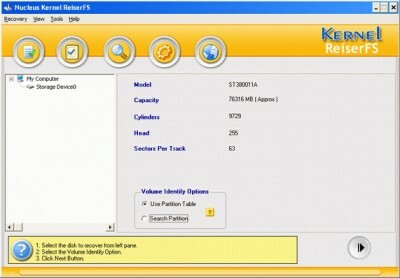 Kernel ReiserFS - Data Recovery Software 4.02 is other software developed by Nucleus Data Recovery. Kernel for ReiserFS recovers data from deleted, formatted, damaged, or corrupted ReiserFS partitions where Linux based operating systems, such as RedHat Linux, Caldera Linux, Mandrake Linux, Turbo Linux, Suse Linux are installed on the hard disk or data storage media. Kernel for ReiserFS supports ReiserFS File System. 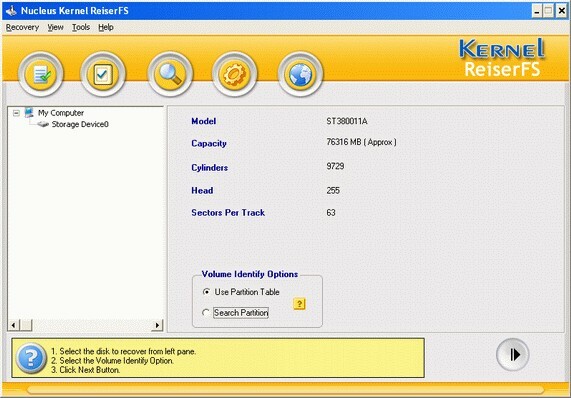 Kernel ReiserFS - Data Recovery Software 4.02 supports different languages (including English). It works with Windows 98/XP/Vista. We have tested Kernel ReiserFS - Data Recovery Software 4.02 for spyware and adware modules. The software is absolutely safe to install. Our website has thoroughly tested other product Kernel ReiserFS - Data Recovery Software 4.02, written the review and uploaded installation file (2309K) to our fast server. Downloading Kernel ReiserFS - Data Recovery Software 4.02 will take minute if you use fast ADSL connection. Nucleus Kernel ReiserFS is a partition recovery utility for reiserfs partition.